Question for all who have a big rear bumper with spare wheel. How did you solve the problem with the rear camera, as it seems to not work anymore as the bumper will hide it, correct? steelstacks and panzr15 like this. Pioneer avh-5800bhs Pioneer 8" sub retrofit. I think the bumper started out as a pelfreybilt but, it's definitely custom because the fogs are from a limited bumper. And the skid plate isn't the same size. Oh man! What is the width of those tires? How did you fit such wide tires? That is one stanced runner! OP- You should make one of these threads for the 3rd gen taco! I think that car needs one of these threads. They're 315's aka 12.5 wide, and 35" tall. Takes a 3" lift and a healthy amount of trimming, plus just the right offset on the wheels. I always have the ball hitch attached to the back of my vehicles just in case the occasional bump happens. An f-150 bumped my sons TRDP and put a nice crease in the f-150 front bumper and nothing to the runner. A $20 hitch with a 2" ball saved a thousand or so in body damage. I got rear ended a couple years ago by a kid in daddy's BMW in my 04 best gen Taco. A couple scratches on my hitch. Punched a hole through his radiator and "customized" his hood pretty good. My rear camera works, but I only have about 60% visibility! Better than nothing...when the little red line on the camera is even with the white line on the ground or wherever I want to stop is about even with my spare tire. What new front bumper is that?! And where and when can we get it! Not sure as the website still has old design...video says order today? May have to call CBI and ask Nathan..
mcharfauros, RanchoRat, inlovewithmy4runner and 2 others like this. Not seeing many front bumpers for 10-13 Runners. Just Demello, CBI, Shrockworks, and ARB. Are there more who make them for these years? Any leads there? Much appreciated. Just got my running rails from Relentless welded on. Snail I just put in an order for running rails. I'm curious is that the powder coat they offer or did you take it somewhere else to get powder coated??? Looks like a matte black if it is. Hey Eric, you got a front bumper that will fit a 10-13 Runner? Thanks Relentless!!! Talked to Brittony and we decided to go with your powder coating. I have no doubt it will come out looking bitchin!!! I believe my current 14+ front should fit fine with trimming the plastic cover similar to how we do on the 14+, however, I havent had a chance to test fit it first hand. I appreciate the response. I'll have to show my wife some Relentless products and see what she thinks. Southern Speed has suspended making their rear bumper. They emailed me that they may start making them again in the future, she wasn't sure. Anybody got pics of bolt on sliders before they went on? 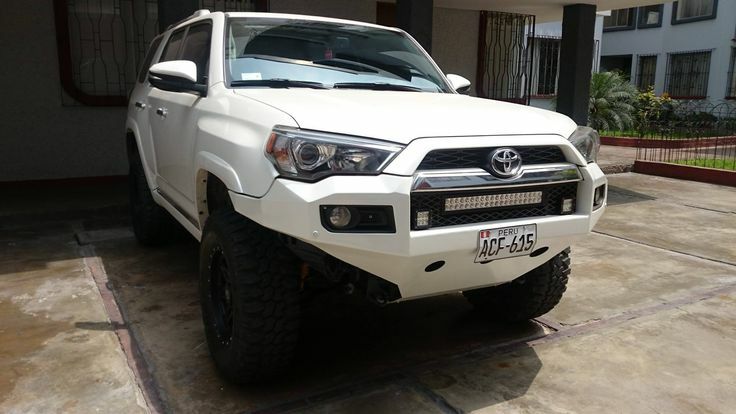 I’m looking for the type that kinda wrap around and support the frame (like mobtowns tacoma bolt on sliders), not just on the side of the frame. Motown doesn’t have them for the runner, as of yet, and I can’t tell from online pictures how they bolt up and attach. Any guidance here is appreciated. Take a look at shrockworks. High quality and mount like you have described. mcharfauros and Riding Dirty like this. Yeah, I really like the design of theirs. I messaged them on TW, but they don’t make 4runner sliders. I keep hoping it will be added to their stuff soon. Got in contact with Adam at 4x innovations. Pulled the trigger on a set of weld-on w/kick out sliders. Great value as they ran me $265 for the sliders and shipping. Ordered them on 11/2/2017, and they arrived today around 12:00, hella fast shipping! Pretty stoked and can't wait to get them mounted on the wife's T4R. That’s cool, but I want bolt on, no welding for me! I know 4x innovations now offers a bolt-on option, also mobtown offroad now makes 100% bolt-on no drill sliders for the 5th Gen T4R. I have the mobtown offroad sliders on my Taco and love them, if i didn't already by the 4x innovations set, i would have gone with the Mobtown Offroad route! What? Mobtown now makes them for runners now too?!? YESS! Snickel Fritz, SgtReckless and DrewMan like this.